Starting in late August, burrs rank high on the Official List of Naturally Occurring Seasonal Aggravations. A recent light-hearted walk along Riverside Park’s upper path turned suddenly burry when Esau, in hot pursuit of temptation-in-a-squirrel-suit, dived into a low tangle of underbrush and emerged looking like the Burry Man of the British Isles. For more about the Burry Man, including his origins and family relations (among them, The Green Man, Poison Ivy, Robin Hood, army snipers and Sasquatch) click here. 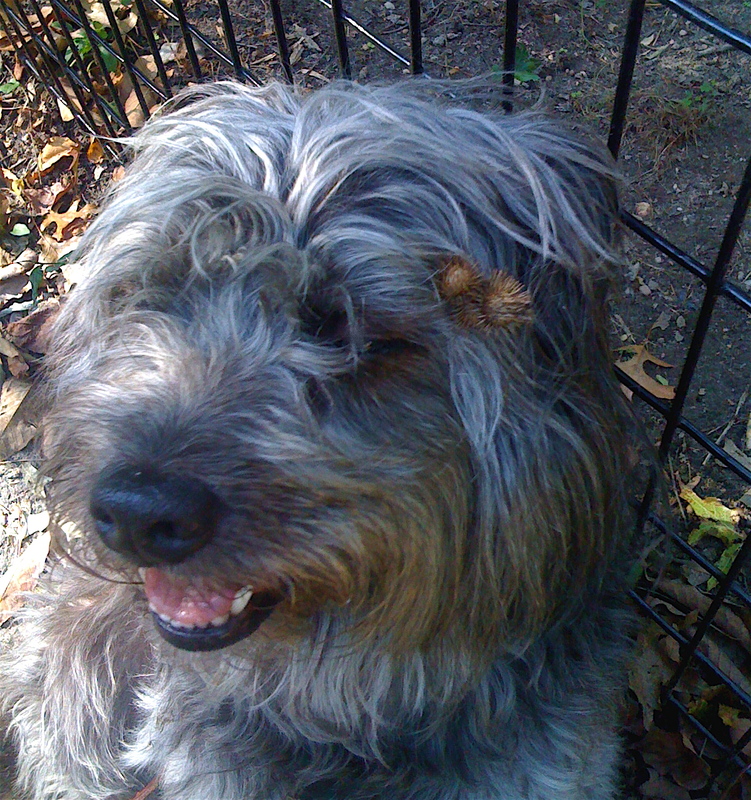 But first, the Burry Dog … and his burrs. 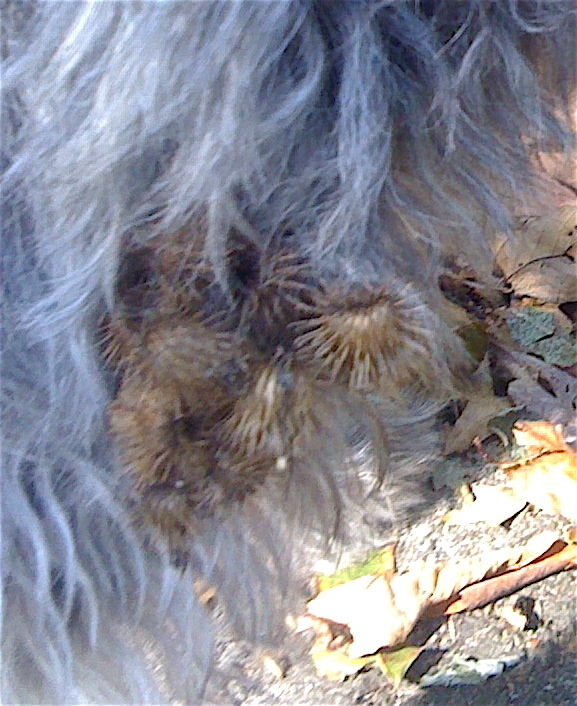 In a matter of seconds, Esau had amassed at least 50 burrs from his ears to his tail. While some burrs operated alone, many clumped together into giant burry conglomerates. I de-burred the pads of Esau’s little hairy feet, but the corporate burrs either resisted removal or broke apart into tiny spiked seedlets that clung to my fingertips and buried themselves beneath Esau’s fur. We abandoned our walk and headed home, where Esau submitted reluctantly to scissors. 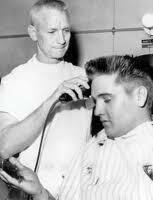 Elvis's Army buzz is in Esau's future. The experience left me wondering: what’s the deal with burrs, anyway? Why do they cling with such persistence to pants legs, hair, fur and shoes? Where do they come from and what do they want? Riverside Park’s burrs are seeds of the burdock plant, a non-native – some might say, invasive – species of thistle from across the pond. Do not be fooled by the pretty purple flower. Burdock has an evil plan, and you and your dog are part of it. What burdock wants is to populate new territory with its progeny. But how? Think about it. You’re a burdock seed. You need to get away from your overcrowded home and make your own way in the world. But you have no legs. You have no wings. You have no car, and no money for a Greyhound ticket. How are you going to get out of Dodge? The answer is simple: Hitchhike. True. But you did evolve nasty little hooks that allow you to attach yourself to any furry, woolly or hairy animal that happens to brush by you. You will use that poor sucker’s mobility to move yourself out into the world. Traveling on an animal’s exterior is called epizoochory and is a fairly unusual method of seed dispersal, used by only 5% of plants. Far more common is endozoochory, in which seeds travel inside an animal by being eaten and excreted. This is, in my nonscientific opinion, a much more harmonious method that benefits both plant and animal. I pity wild animals with massive burrs entangled in their fur and no fingers or scissors to free themselves. This entry was posted on October 18, 2010 at 8:50 pm and is filed under 2010, Flora, In the City, NYC Parks, October, Riverside Park. You can subscribe via RSS 2.0 feed to this post's comments. Witty, wonderful blog reminding those of us who love dogs but don’t have one at the moment that sometimes it’s best to enjoy other people’s burry pooches. Yes, so true. Those are the times I too wish I was enjoying someone else’s well-cared-for dog. Burrs are wonderful hitch hikers that, although annoying, are tenaciously wonderful at finding new territory. One of man’s great inventions “Velcro” was actually not an invention at all but a copy of one of nature’s most successful seed disprsents-the burdock. Enjoyed the post, very witty and thoroughly enjoyable. 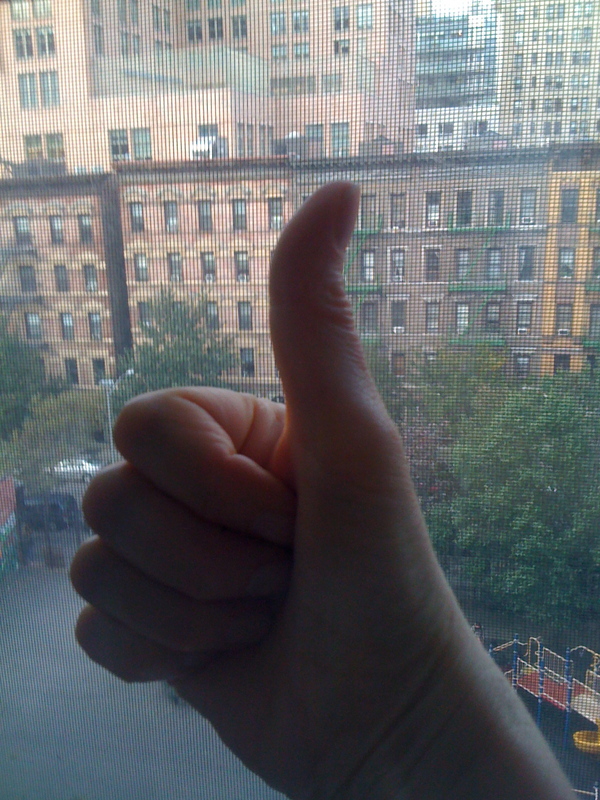 Wow – what a terrific post! Funny and informative – and since I live in the country a reminder to watch out for my dogs when we’re walking in unknown territory. 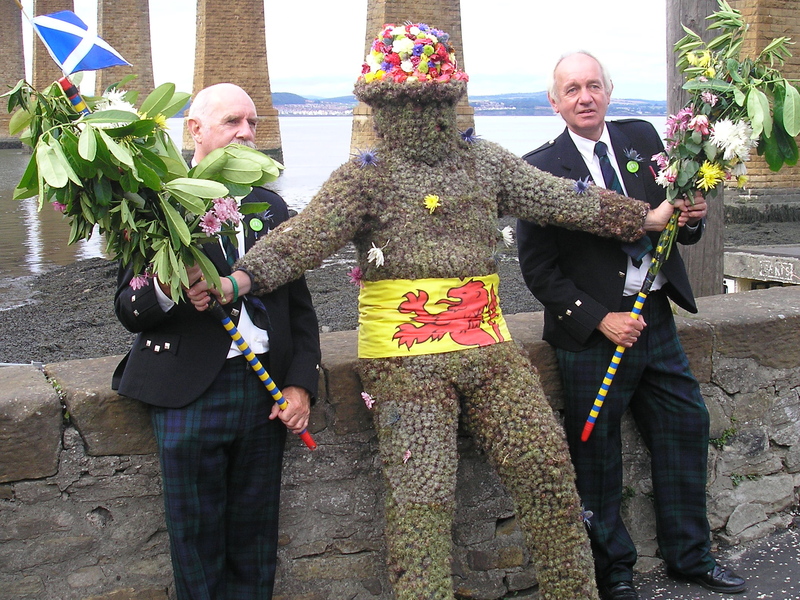 Thanks for the great story about the Burry Man – hope Esau stays out of the burr patch… will keep watching for more stories! Well done. Peanut butter! Of course. I believe people use it to take bubble gum out of kids’ hair – so why not burrs? Thank you for stopping by, Barbara. Funny post! I didn’t know there was burdock growing in the park…I usually only see them on Japanese restaurant menus. 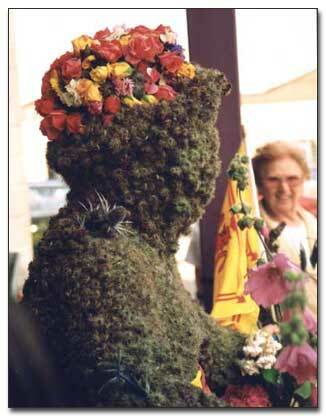 Burry Man looks like the Green Man’s drunken English cousin. I was walking through Prospect Park recently. My camera was inside my cargo pants pocket, the big one on the thigh, with the wrist strap hanging out. Burrs found the strap. I’m not so sure they don’t do the (reputed) tick thing, which is to leap wildly from the plant itself when they smell warm blood. Well, this is totally off subject but you must see this article about “Moss” man who robbed a museum and then hid in the woods in a moss suit. He reminds me of your Burry man, or of poor Esau covered in burrs. Moss man was found when a police dog bit a big lump of moss on the ground: http://articles.sfgate.com/2010-10-15/news/24138524_1_rock-museum-bites-dog. Somewhere in my more and more haphazard memory banks is the info that the guy who invented velcro was inspired by looking at the shapes of the little burr hooks and the way they snag everything. Also, aren’t the roots roasted as a coffee substitute, along with chicory and a few other similar taproots? After a huge extravaganza burr war on our street when we were kids my mother spent hours with tweezers removing all those tiny little hooks from our skin. The big boys had been shoving handfulls of them down our T-shirts. The glories of childhood. Yes, the velcro man was indeed inspired by burrs. And yes, the roots can be eaten or roasted and drunk. 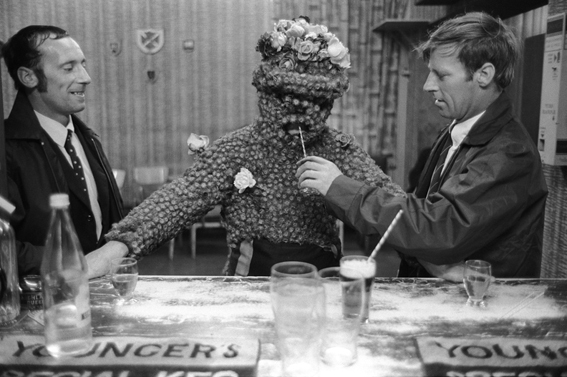 I think I’ll have to do Part Two on the burdock plant as well as the upcoming Burry Man post. Those big boys were NASTY! Ouch. A joy to read and learn so much. Keep it up. Yikes, that sounds awful. I don’t think I’ve encountered sand spurs, despite endless hours on Long Island, Cape Cod & Oregon beaches. Maybe a Southern thing? Or else I’m just lucky.